One of the pupils was in the clerks room almost in tears today. “I’ve just lost my first trial,” he moaned. “Losing your first case is just the first of many rites of passage in a career at the bar,” said HeadofChambers. “More like the Via Dolorosa,” said BusyBody. “Next you’ll have a solicitor refusing to pay your fees,” saidTheVamp. “Or maybe a disgruntled client blaming his defeat on your performance,” said TheCreep. “Though in your case those clients may well have good reason,” said BusyBody. 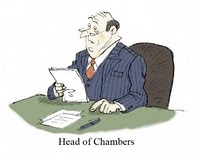 “Then you’ll have someone arrive into chambers at your level of call and take all your work,” said BusyBody. “Then your shelf will be empty and your clerk will tell you to take a month off while things are quiet,” said Teflon. “And then you’ll get a case which lasts perhaps a year in court and still lose,” said UpTights. “On a no-win no-fee,” said OldSmoothie. “And a little later you’ll find your application for silk is politely declined,” said HeadClerk. “That’s before your application to be a judge also fails,” said OldSmoothie. “And they’re just the good times,” smiled TheBusker.